As I liked the main game, I was pleased to hear there would be an expansion. However, I have realised over the years that the majority of expansions (especially for non-narrative games) end up adding more noise than gameplay – some friends and I worked out recently that we usually buy expansions because we’d like to see extra variety, but then more often end up playing the base game without the expansion because it’s usually tighter. So, into which of these categories was Village’s expansion (called Village Inn) going to fall? 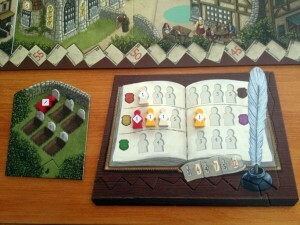 The expansion comes with pieces to expand the game to up to 5 players. To facilitate this, there are all the usual player pieces as well as extra resources and a new village journal and graveyard with a few additional locations for honoured (and not so honoured) village members who are no more. This is a nice and simple addition as I found that the game plays equally as well with 5 players as it does with 4 players. Also, the extra player can be added without using any of the new rules/pieces too so it can just add an extra player to the original game. However, the key new part of the Village Inn expansion is the Inn (as you may have guessed from the name) where you can hire specialist villagers as well as perform the new craft of brewing beer. Beer is handled just like the other crafts and you can spend time to train a villager to make beer or spend items to make it (in this case, grain). 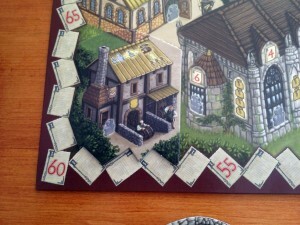 Beer can be used for two things: Some customers at the market want beer (like other items produced by the crafts so there are a few new customer tiles with beer on them); however, the more interesting use is in hiring special villagers at the Inn represented by 30 villager cards. The Inn is a new location so it has some action cubes placed next to it which limit the amount of special villagers that can be hired each round (just like the other action locations). To hire a special villager, a player must place (or have placed) one of their villagers at the Inn (much like being a trained craftsman) and must spend a little bit of time as well as a small amount of beer or gold. At all times, there are 3 random face-up piles of special villager cards. 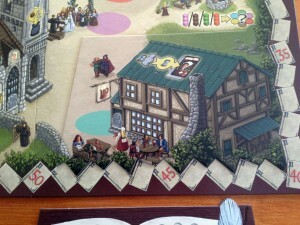 A player using the Inn action first places one of the displayed cards at the bottom of its stack revealing a new one (so a player that doesn’t like any of the 3 on show may at least be offered one they do want), and they can then choose to hire any 1 of the 3 now on display if they pay the cost displayed on the card which is either gold or beer. Each villager card gives a different benefit – some earn victory points (VPs) at the end of the game based on various criteria, some give instant effects, and some have effects that can be used at any time but only once as they are then discarded. Some give instant VPs when they are taken too. The powers of the cards are quite subtle (which is important as it would unbalance the game if they were too powerful) but can be very effective if used at the right time. As a result, the villager cards can give each player a slightly different perspective on the game as some elements become more and less important to them than other players – and that’s an aspect I always like in a game especially as it avoids options being categorically better or worse than others for all players. For example, one villager gives extra VPs for each brown cube still in your farm at the end of the game, another gives you 2 ploughs immediately for free, another lets you place a ‘visited’ marker on any city and gain that bonus, another lets you serve any customer in the entire market queue, another lets you place a relative who has died anywhere in an extra imaginary slot in the journal, and so on. It is humorous that Village Inn contains some good life lessons which are: 1. Giving people beer often gets them to do things for you, and 2. Any player that dies because they spent all their time at the Inn goes straight to an unmarked grave. In their words: “Feckless boozers do not get mentioned in the chronicle!” – Wise words for us all. Overall, I really liked what Village Inn added. The 5th player addition is an easy positive, but the new gameplay from the Beer, Inn and villager card elements works really well in harmony with the main game. The powers of the villager cards are nicely varied and make a difference but the powers are not too extreme either. With 3 villager cards on show at all times, you usually had a good choice – plus you could also bury a card that you want to deny another player from obtaining. The new journal and graveyard (for 5 up to players) in their off-board frames to make them all neat. The expansion has a very nice physical touch to it too. You can use the new graveyard and journal on the board to replace the old ones if you have 5 players without the Inn and Beer rules (and the jagged edges ensure the parchment sheet scoring track is not obscured. However, if you use the Inn and Beer elements, the Inn and Brewer sections replace the original journal and graveyard locations respectively and the journal and graveyard are placed at the side of the main board along with a card frame to make the jagged edges nice and straight. It really in a clever physical design beyond expectations. In the end, I think the Village Inn expansion is a totally positive addition. The new rules elements add a small amount of extra variety and options, but without changing the game or making existing elements unimportant. 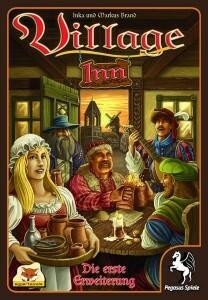 I will always be using the Beer and Inn elements in my future games and, for me, that’s definite praise indeed for an expansion. This entry was posted on Monday, August 19th, 2013 at 3:08 pm	and is filed under Board Game Review, Board Games, Village, Village Inn. You can follow any responses to this entry through the RSS 2.0 feed. You can leave a response, or trackback from your own site.